While harsh chemicals like Ammonia, Sulfur Dioxide, Chlorine and Aluminum phosphates have marked their place in the industrial marketplace, these chemicals can also be extremely corrosive. Their corrosive properties can sometimes make way for these compounds to corrode the metal equipment that you work with on a daily basis. Whether you’re dealing with the potential for a drum to spill harsh chemicals or with the raw material itself, corrosion is a fact of life in the chemical industry. If you’re working with industrial scales, there are certain materials you can use that will hold up to the corrosive properties of harsh chemicals. When it comes to choosing a scale to handle corrosive materials you want one that is manufactured with the use of corrosion resistant material, like stainless steel. A large number of scale manufacturers may offer stainless steel platforms and bases, but what about the internal components of a scale? Equipment isn’t always damaged simply by direct exposure. Sometimes, the fumes released by a corrosive material can cause damage and can get into a scale that doesn’t have any liquid leaking. One of the most important components of a scale is the load cell. The load cell is actually responsible for interpreting the weight of the load present on the platform into numbers that are displayed on a digital indicator. Many manufacturers use inexpensive aluminum construction when machining their load cells, which not only leaves them susceptible to damage from corrosive materials, but it also leaves them prone to damage from regular stresses present in most industrial environments. At Arlyn Scales, we do things quite differently. We’re an actual scale manufacturer, not just a distributor. This difference allows us to have complete control over the processes and the quality of all of the materials within our scales. When we manufacture our strain gage load cells, we only use stainless steel. Not only does this protect the accuracy of your weight readings, but it also ensures their durability and ability to handle the stress of daily life in harsh, industrial environments. All of these manufacturing improvements help to translate into additional years of life compared to using other scale models. Often times, when you purchase a scale, it will be coated with a “protective” layer of paint. However, what other manufacturers refrain from telling you is that this “protection” equates to nothing more than standard enamel paint. Once the paint is scraped or scratched off the scale, it loses all of its protective qualities and leaves your scale susceptible to rust and corrosion, as if the protection was never there in the first place. Even if only a small chip is missing, corrosive compounds can get underneath the paint and travel to other parts of the scale. In these instances, you may not even notice the damage until it’s too late. At Arlyn Scales, we take a rather different approach in protection from corrosion and rust. Our stainless steel scale platforms can be purchased with a protective coating. This coating is a polyamine-based triple epoxy that we infuse using garnet particles to give you added protection not only against corrosive materials, but also against scratches, abrasions and scuffs that would damage a less protected scale. 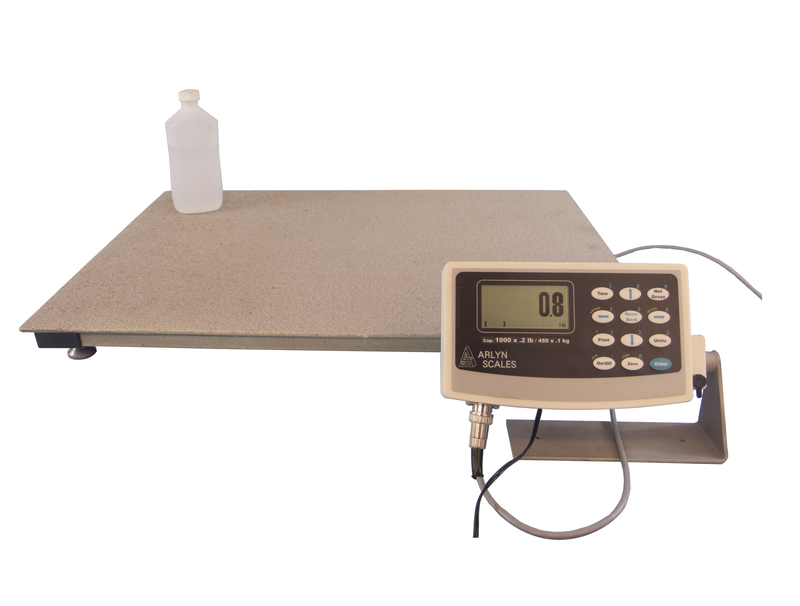 While we understand that your budget may not allow for you to purchase fully stainless steel scales, we do offer other, less expensive options that are still equipped with stainless steel load cells. While we offer an optional coating on our stainless steel models, all of our steel scales feature a zinc particle triple epoxy. Regardless of the type of scale you buy, eventually, the protective layer is either going to be scratched off or chipped in certain places. With our zinc epoxy, the particles become oxidized and can protect the scale from corrosion, even if the epoxy is scratched. This is a far superior alternative to standard enamel paint, which when scratched, offers no protection at all. Whether you choose to purchase a stainless steel or steel model, our scales will undoubtedly provide years of trouble free service, unmatched by our competitors. Depending on the type of corrosive chemicals you work with, your facility may be classified as a hazardous location by the Occupational Safety and Health Administration’s National Electric Code. Corrosive materials are often identified with a Class I hazardous area classification. This simply means that flammable vapors or gases are present in the air in enough quantities to become a source of ignition and ultimately, an explosion. If you’re designated as a Class I location, we offer a line of explosion proof scales that are intrinsically safe to operate in Divison I and Division II, Groups A-D. Class I locations typically include dry cleaning plants, petroleum refineries, utility gas plants, aircraft hangers, areas where gasoline is stored and/or dispensed, among others. Our ArlynGuard series of intrinsically safe scales include cylinder scales, platform scales, small bench scales, platform scales and floor scales. 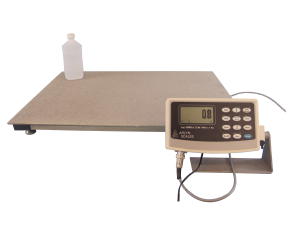 Capacities of our ArlynGuard scales range from 5 pounds to 20,000 pounds. These scales can be used around chemicals such as hydrogen, ether, fuels, hydrocarbons, acetylene and other similar chemicals and compounds. Unlike many scale providers, we don’t source any of our scales from a manufacturer. In short, we are the manufacturer. This allows us to not only control the designs, the processes and the quality of our materials, but it also allows us to offer competitive pricing that simply can’t be matched by our competitors. With no middlemen to drive up our scale prices, you can get a high quality piece of equipment at a cost that is well within your budget. If you’re still unsure about what the next step may be in terms of the scale selection process, our customer service staff is standing by to assist you. We have decades of experience helping our customers find the ideal scale for their unique needs and can even design a custom scale if one of our existing models doesn’t meet your needs. So, give us a call today at 1-800-645-4301 to learn more about our ever-expanding selection of industrial scales.